This entry was posted in "Four legs good", My Stats, Random Stuff and tagged Black Vetyver Cafe, Chanel, Coromandel, Dawn Spencer Hurwitz, DSH Perfumes, French Lime Blossom, GF Ferre Lei-Her, Infusion d’Iris, Jo Malone, Nectarine Blossom & Honey, Prada, Vanilla & Anise, Wild Fig & Cassis. Bookmark the permalink. ← A Postcard from Undina: A Smile a Day… (but may I still keep the Doctor)? That is a great post and a great idea for a discussion. Many thanks to Suzanne and Hajusuuri for sharing their optimistic perfume stories. Speaking of me, I think I’m somewhere in between the introvert and an extrovert perfumista. When people don’t know about my hobby and don’t ask about it – I just don’t tell them that I’m this much into perfume. I didn’t convert anyone from not-liking or being indifferent to perfume to someone who would like fragrances. But I did convert 2 readers of my blog into iris lovers, while they were too afraid of the note earlier. Hey Rusty! I didn’t know you had your own “yellow submarine” :) Or is it more of a tank? I do not actively invite people from my RL to read my blog but if they ask, I do not mind sharing since my online and offline personas are very close. Wow, that twist at the end of the DSH story was fantastic. I also loved the purposefully nonchalant way Suzanne handed over the Coromandel – with great success. As for your own, I agree Jo Malone is a great starter house. I will always try with friends and colleagues because I love match-making people with perfumes but no real success stories, sadly. My mother and sister now have nice little collections thanks to me but no great loves I’d say. My friend fell for the Diptyque Ofresia I gave her a sample of but wouldn’t pay the cost of the bottle and ended up with D&G Light Blue instead, so I’ve given up there. Another likes the perfumes I’ve gifted her but again, no great loves. Oh well. I should say that I felt very proud once I came up with the idea of using these two pictures of Rusty to illustrate two character traits. As to your friends, I think you gave them a nudge into the right direction and who knows but once day it might prove fruitful. Maybe it’s because I live in a place where perfume and fragrance are such an integral part of the culture but, I’m definitely a perfume extrovert, always trying to convert people I know. My own success story is when I gave a good friend of mine (who is Emirati) a sample of Amouage’s Al Mas attar and when he smelled it he immediately said it reminded him of something his mother used to wear, and I could almost see a tear in his eye (she had recently passed). I immediately went and bought him a bottle and now that all the Attars have been discontinued I am even more glad I did. He told me that people often ask what he is wearing and he will just say that it is something personally selected for him. Even if he doesn’t start buying a ton of perfumes I am happy I could bring him a little joy through scent. You are a great friend! I hope the attar lasts him for a long time (it’s so frustrating that they’ve discontinued attars). Haha – fun post and perfect photo illustrations! I loved the stories of Suzanne giving her writer friend Coromandel and Hajusuuri’s sister’s casual telephone encounter with DSH. My SIL actually got into Montale herself pretty soon after she started exploring new scents, so that is interesting about your newbie friend’s similar liking. I had sent my brother some 40 samples of men’s frags to try, and that seemed to kick off a curiosity about niche perfumes in both of them. Yes, rampant evangelist here – ever since I had my own ‘rose to Damascus experience’ in 2008. I even started a series of posts called ‘perfumista protege progress reports’, where friends I have introduced to new scents would write up their own ‘before’ and ‘after’ stories – you have prompted me to carry on with that. Most recently, I helped my friend N find perfumes beyond her signature scent of L’Eau d’Issey – at her own request. ;) She was very taken with IUNX Eau Frappee, Carven Le Parfum and Jasper Conran Woman, which are all rather different from the Issey Miyake. Thank you, Vanessa. I loved Suzanne’s and hajusuuri’s stories too. I tried searching your blog for those reports – and didn’t succeed (though I remember reading something along the line before). Well, this is a very good question…thinks about it…personally introverted but big time into converting people in print. I’m not surprised that Dawn had been Hajusuuri’s sister’s perfumer of choice because so many DSH perfumes are like chocolate (very hard to stop indulging in). Right now I’m wheedling people to try Neil Morris (another Boston area perfumer) for no particular reason, I just think he’s under-appreciated. When I love something I want to share, besides he does floral aldehydes and you can’t hardly find new versions of those anymore! I realized that I haven’t tried yet any of Neil Moris’ perfumes. I’m the same way: when I love something I want others to experience that too. I’m going to claim I’ve earned my perfumista badge, because as soon as Hasjusuuri described the place in Boston and her sister placing orders with Dawn, I knew it was Dawn Spencer Hurwitz (I remembered reading about it in connection with DSH’s background … and if I’m not mistaken, Sarah Horowitz used to work there too). Great story! I’m a perfume extrovert, mostly. I think it’s the only area of my life where I’m extroverted. Interesting! So I was right to doubt the direct link between being extroverted in other areas of life and related to perfume. Introvert. I don’t like to discuss anything about myself typically and it’s even harder to discuss perfume…maybe that’s because I’m a guy. I love those stories, and especially the Dawn Hurwitz one…it just goes to show that the world is a very small place! I haven’t pegged you as an introvert. But I’m sure that with your writing you’re converting more people than some others by talking. I can’t believe I didn’t mention how snappy Rusty looks in his yellow submarine! A treat goes to Rusty (into his submarine – I keep putting them in here from time to time when he doesn’t see – so he thinks they are a product of abiogenesis). I don’t believe that Rusty is that gullible. He no doubt has you trained! Yeah, I’m familiar with that type of blank stares :) But those other cases make it all worth trying! I laughed and laughed when I saw the pictures of extrovert and introvert Rusty. 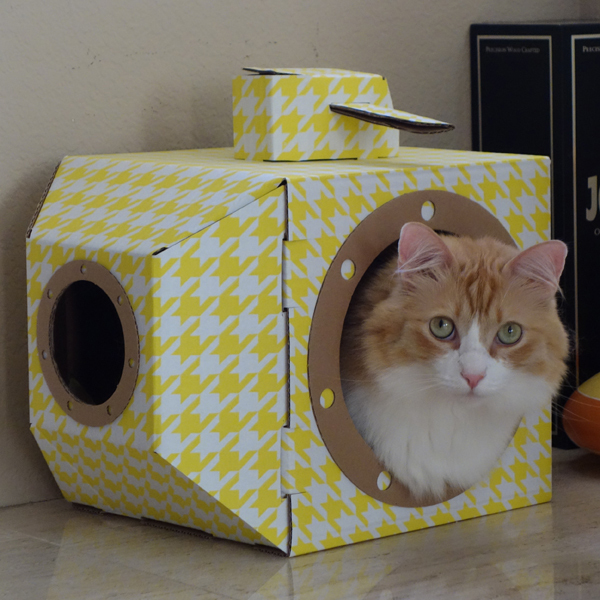 No treats for him though, in my name, because he needs to continue to fit into his uber-stylish yellow houndstooth hideout box! Wow, there is something to be said about Jo Malone being “starter” perfumes – I think they are easy to wear and generally more accessible. Even though I can pretty much go into Macys Herald Square if I wanted to, I only do so when it’s raining and feel like a break from holding my umbrella. In any case, a Jo Malone counter opened up a few months back so I do not have to be stuck with the stuck-up SAs at Saks to get my Jo Malone fix. I forgot to answer the question – I will say I am a situational perfume extrovert. I only let a few insiders know the size of my perfume collection but I do find myself animatedly talking about perfumes when it is the topic of conversation. I am working on a project to provide someone with a vanilla and lavender-centric perfume samples. I want a list of lavender-centric perfumes you end up collecting: I like lavender but so far I tried only Brin de Réglisse (I have a travel bottle) and Gris Clair (I have a sample). I smelled Kiki at Jovoy last year but I didn’t have any skin left to test. Other than that somehow I missed all other lavenders – so I’ll be curious to know if there are any that you like (being a perfume twin). 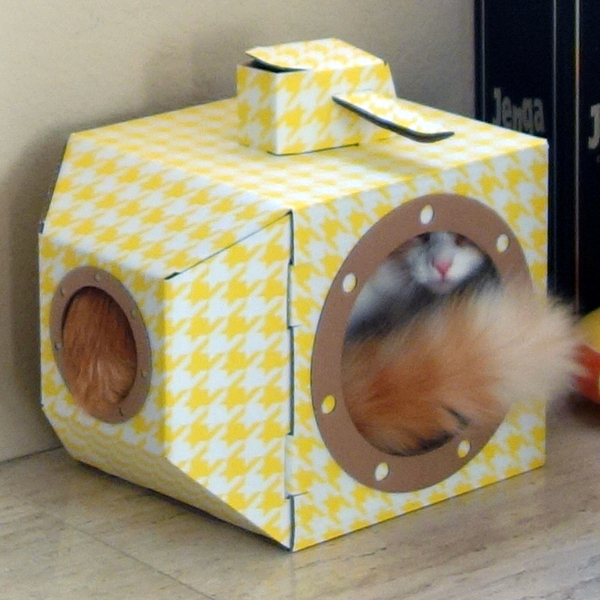 Rusty got that box from my friend who bought two of those for her cats at kickstarter but both of her cats refused to use it – so Rusty got the second one (and my vSO and I spent some time assembling it) and he likes it and uses from time to time. I’m glad I managed to take those pictures of him – they just fell into place when I was looking for a picture to illustrate the post. Thank you once again for contributing your great story – I really enjoyed it. In all things, I am an extrovert! Semi-Extrovert, but I feel like I’m preaching to the converted. Most of my friends like their perfume anyway and those who don’t won’t get bothered. I still feel funny when I mention the blog, don’t know why actually, but I hope that will become better eventually. With those of your friends who like perfumes a good tactic would be to offer something that is similar to what they like (but better – though you shouldn’t say that!). “I smelled X and it reminded me of the Y that you like” or “When I smelled Z I thought you might like it since you enjoy Y”. Or “W is like a day [night] version of your Y”. I’m a half way between. I’ll talk and talk with people who know about my interests in perfumes but I don’t usually bring the topic up in conversation with those who know nothing about my perfume addiction. thinkingmagpie! We’re alike in our perfumista life where a topic of interest brings out our extrovertedness. Bringing it up to others who don’t share the addiction probably brought their fair share of blank stares! P.S. I am responding on Undina’s behalf as she will be offline for a while. I loved reading this post and comments :) I didn’t realize Rusty was in a submarine until I read the comments! I am usually an introvert in all things including perfume, though I did eventually open up to some of my officemates/friends. My line of work is also relatively intellectually rigorous, for what that is worth, so I sometimes think people will not take me as seriously if I were to let loose about my love for perfume (I know that is silly!). My firends and I don’t talk about perfume a whole lot because our tastes are very different (and I like to try more things pretty much constantly, whereas my friends seem content to have one bottle and one bottle only…how do people DO that?? :)). However, it is still fun to pass along a perfume that I think my friends might like! In life, I’m pretty extroverted. I love talking to people and will start up conversations with pretty much everyone. I might add that I generally interpret “What is that??? ?” as a rhetorical question.